Yes, Google Voice for the iPhone is finally here, albeit as a Web app, allowing you to place calls from your Google Voice number, send free text messages and view transcribed voicemails. While most of the app's core functions remain intact, there are certain limitations to the Web app. The Web app version of Google Voice can be accessed at m.google.com/voice. Screening and forwarding works like a charm, and I was especially pleased to see names and pictures show up in caller ID during incoming calls. Seeing as this is a Web app, you can't record your name or custom voicemail responses. I understand this can't be done in Safari, but I wish there was a way to set up a call with Google Voice and record these settings over the phone. It's also impossible to download voicemails for offline access, which is probably more a limitation of the iPhone than anything else. Some options are inexplicably missing. For instance, you can't write or read notes appended to voicemails or calls. You also can't block specific phone numbers or change your own Google Voice number. Worst of all, contact management isn't nearly as robust on the iPhone. You can't add, remove or sort people into groups directly from the iPhone. Finally, you can't invite people to Google Voice in the Web app, which is a shame. 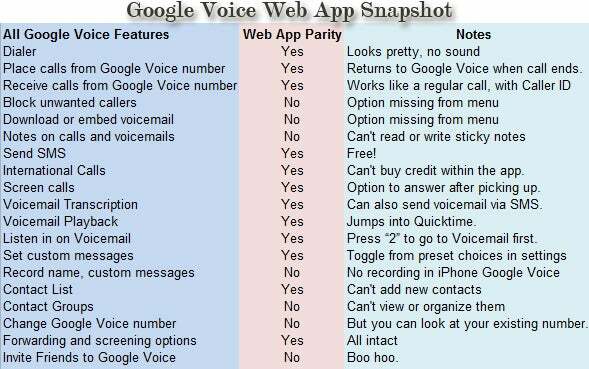 Fortunately, none of these limitations will preclude iPhone users from getting a lot out of Google Voice. Most of the missing features are things you can set and forget on the computer, save for contact management and sticky notes. And, of course, all of this is better than nothing, which is what Apple preferred.